Finally, its complete. 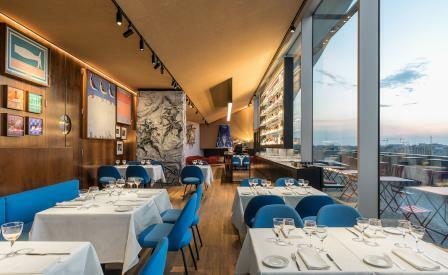 After years of construction, the last piece of the puzzle at Fondazione Prada’s OMA-designed contemporary art compound fits into place with the launch of Ristorante Torre on the sixth floor. Visitors are warmly greeted, quite literally, by Italian master Lucio Fontana, whose 1949 glazed ceramic Cappa per caminetto (fireplace hood) sits pride of place amongst Soviet armchairs and Eero Saarinen Tulip tables. Along the north wall, floor-to-ceiling windows and a 125 sqm terrace frame sweeping views towards the city centre. While opposite, richly textured walnut panels and earthy hemp textiles allow a touch of intimacy within the tower’s otherwise sharply modern architecture. Jewels from Fondazione Prada’s legendary art collection — paintings and sculptures by Goshka Macuga, Jeff Koons and John Wesley — line the walls alongside artist-designed dinner plates created for the restaurant by John Baldessari, Thomas Demand, Mariko Mori and others. Safe in a good home and back in use are furnishings from Phillip Johnson’s iconic Four Seasons Restaurant in New York. Cantilevered Brno Chairs and custom banquettes were scooped up by Fondazione Prada when the modernist marvel, designed in 1959, was unceremoniously dismantled and auctioned off in 2016. Meanwhile, Saarinen Executive chairs parked at wooden tables account for the remaining 84 seats. Chef Fabio Cucchelli has sourced recipes from a number of Italian regions, but with an added twist. For the next year, a rotating cast of under-30 chefs from home and abroad will take up two-week posts in the kitchen, shaking up the menu with an injection of youth.